Ted Knight (1923-1986) is best known as goofy anchorman Ted Baxter on The Mary Tyler Moore Show or the pompous judge in 1980’s Caddyshack. But he spent years as a character actor before either of his breakout roles. Knight had small roles in The Twilight Zone, Psycho and Gunsmoke among many acting credits. He even played a criminal mastermind in The Night of the Kraken, an episode of The Wild Wild West airing during the 1968-69 season. In one of his appearances on The FBI (The Executioners Part I), he played the head of a Cosa Nostra “gun drop” in New York City. 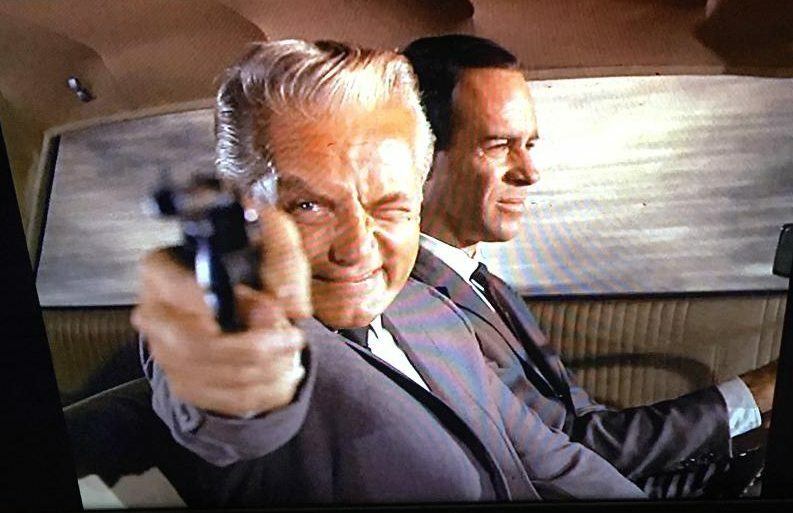 He (unwisely) tries to shoot it out with Efrem Zimbalist Jr.’s Inspector Lewis Erskine. Knight also played a part in a con job. Knight was a friend of Filmation co-founder Lou Scheimer. Filmation in 1965 was seeking the license from DC Comics to do Superman cartoons. But DC executives wanted to see a busy studio hard at work. Scheimer arranged for artists from Hanna-Barbera to show up, pretending to be working on cartoons. Knight also was recruited, pretending to be a film editor. The con worked and Filmation got the job. The New Adventures of Superman in the fall of 1966 on CBS. The show consisted of two Superman cartoons with a Superboy cartoon in-between. Knight was the narrator of the Superboy cartoon and did other voices. Knight soon got work on other Filmation shows, including Fantastic Voyage, Journey to the Center of the Earth and Aquaman. In 1968, Filmation came out with a Batman cartoon where Knight was narrator and voiced most of the male villains. 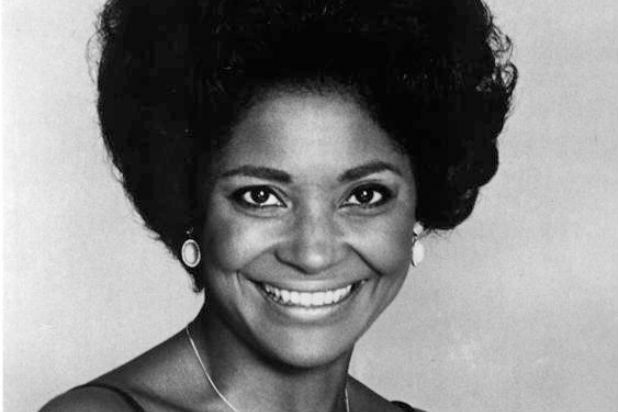 Knight became a bigger name once The Mary Tyler Moore Show came along. It turned out that Ted Baxter was one of the hardest parts to cast. Allan Burns described what happened in an interview for the Archive of American Television around the 5:05 mark. From then on, things were never the same for Knight. James Frawley in The Giuoco Piano Affair episode of The Man From U.N.C.L.E. James Frawley, a character actor and Emmy award-winning director, died Jan. 22 at 82, according to the Palm Springs Desert Sun newspaper. As an actor, he some times played secondary villains. His acting appearances included episodes of The Man From U.N.C.L.E., I Spy and The FBI. He branched into directing during in the mid-1960s. He was active into the 2000s, according to his entry on IMDB.com. Frawley won an Emmy for an episode of The Monkees and was nominated for another. He directed 28 episodes of that comedy series. But he proved adept at drama as well. The director helmed six episodes of Columbo. Some of them included unusual staging. Murder, Smoke and Shadows in 1989 featured a young director as the killer. Some scenes emphasized visual tricks of movie making. Murder, a Self Portrait, also that same year, featured Patrick Bauchau as the killer. The episode included recreation of dreams described on tape. Frawley also directed episodes of the original Magnum, PI, Scarecrow and Mrs. King and Law & Order. 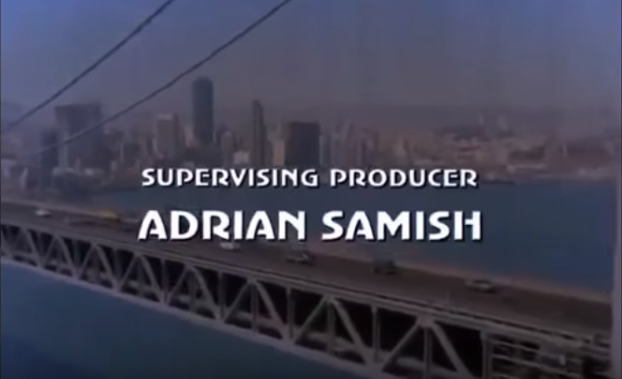 He also helmed The Muppet Movie. Below is a video from the 1967 Emmys when Frawley won his directing award. It includes Barbara Bain and Bruce Geller of Mission: Impossible also getting Emmys as well as Buck Henry and Leonard B. Stern of Get Smart. The holidays are fast approaching. With that in mind, the blog is reminded of some Christmas-themed spy-related entertainment. 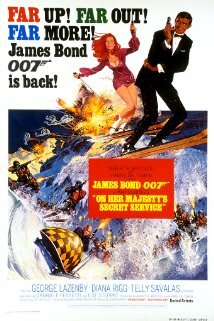 On Her Majesty’s Secret Service (1969): The sixth James Bond film produced by Eon Productions may not be an “official” Christmas film but it’ll do. James Bond (George Lazenby) is hunting for Ernst Stavro Blofeld (Telly Savalas) while also falling in love with Tracy (Diana Rigg). This time out, Blofeld has brainwashed his “angels of death,” who will spread “virus Omega” at the villain’s command. If that happens, that will wipe out all sorts of crops and livestock. Bond manages to go undercover at Blofeld’s lair in Switzerland but is discovered. Blofeld sends out his latest batch of “angels” on Christmas Eve. Bond manages to escape, meets up with Tracy. Bond proposes to Tracy, but she gets captured by Blofeld, setting up a big climatic sequence. It was the first Bond film to end unhappily when Tracy is killed on her honeymoon with Bond. It’s arguably the most faithful adaptation of an Ian Fleming novel and an epic film in its own right. And, for what it’s worth, there are many reminders of Christmas during the Switzerland sequences. Teaser trailer for Diamonds Are Forever: Diamonds Are Forever was released for the Christmas move season of 1971. The teaser trailer played up the Christmas angle. The movie also marked Sean Connery’s return as Bond after a four-year absence. But the teaser trailer had a gunbarrel without Connery (but still wearing a hat). Teaser trailer for The Man With the Golden Gun: The teaser trailer for Roger Moore’s second 007 film utilized a similar Christmas theme. On top of that, the trailer had a scene between Bond and Scaramanga (Christopher Lee) that didn’t make it into the final film. The Man From U.N.C.L.E. : The Jingle Bells Affair (first broadcast Dec. 23, 1966): The story begins in New York during the Macy’s Thanksgiving Day parade (the start of the Christmas shopping season). U.N.C.L.E. 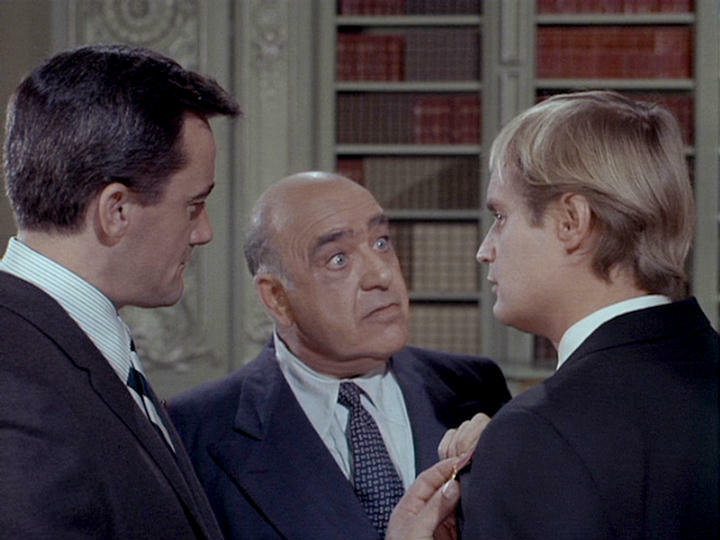 agents Napoleon Solo and Illya Kuryakin (the latter, after all, a Russian) are acting as bodyguards for a Soviet leader, Chairman Koz (Akim Tamiroff). Why Soviet? In one scene in Act III, Koz slams a shoe down on a desk, a la Nikita Khrushchev. At one point, Koz gets separated from the U.N.C.L.E. agents and dresses as Santa Claus and interacts with children. Koz, dressed as Santa, helps to save the life of a sick kid. In the end, East and West call a truce and wish everyone Merry Christmas. 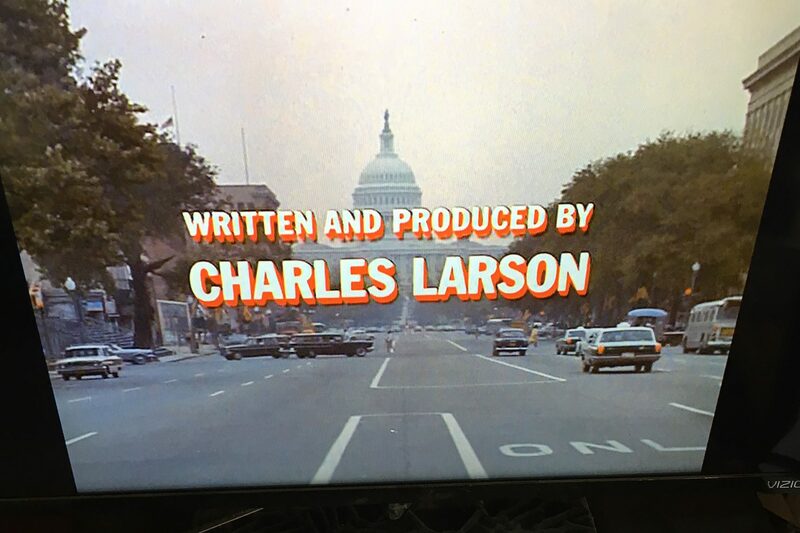 This was a third-season episode when the series went in a campy direction. 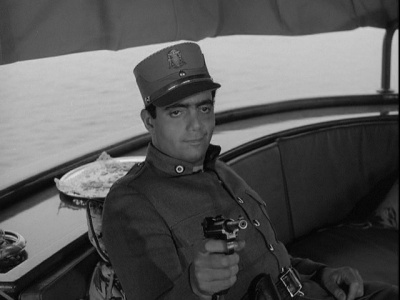 The Spy Commander’s review on the third-season page of The Man From U.N.C.L.E. episode guide doesn’t give it a high grade. 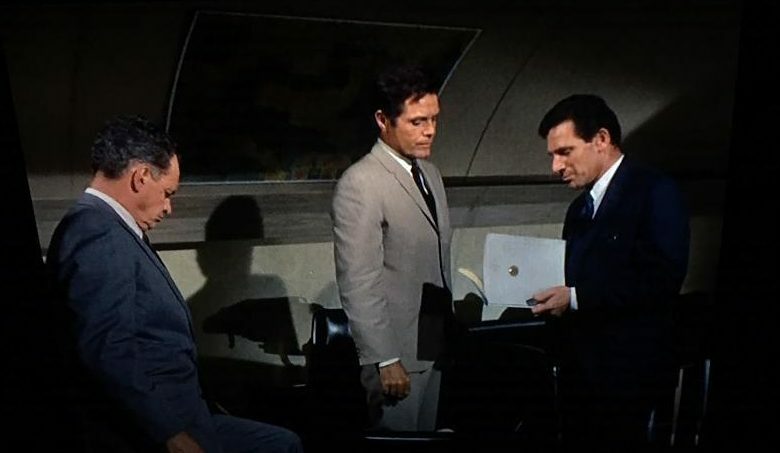 The FBI: Dark Christmas (first broadcast Dec. 24, 1972): FBI Inspector (Erskine) and Special Agent Colby (William Reynolds) are on the trail of a hit man (Don Gordon). The hit man’s target is a family man who once was involved in a criminal organization but got out. The case reaches a climax on Christmas Eve. The family man is coming home from a job but doesn’t know the hit man is waiting for him at his home. Colby and other FBI agents get the man’s children to safety. Erskine then confronts and apprehends the hit man. 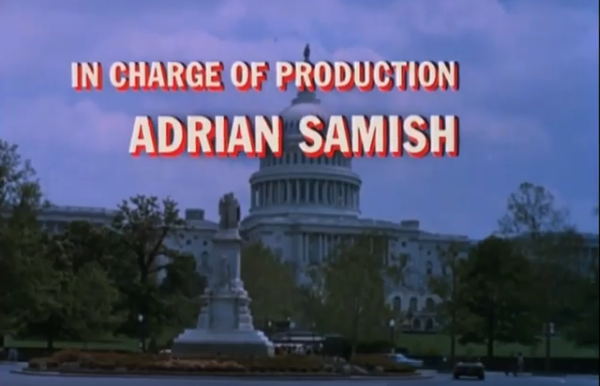 Until Act IV, the episode is a basic procedural show. The Christmas themes are mostly in the final act and epilogue. While The FBI wasn’t a spy show per se, it had a lot of espionage-related stories. Also, it’s the subject of another website of the Spy Commander, The FBI episode guide. This episode gets a relatively high grade on the eight-season page. Note: This was an early credit for Sondra Locke (1944-2018), who plays a spinster-like character who falls for Gordon’s character.